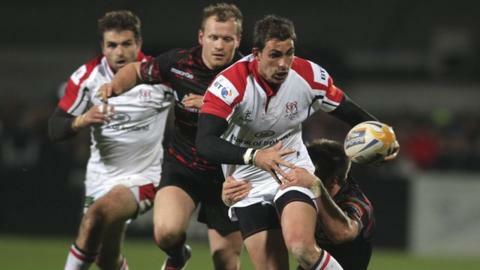 Ulster continued their unbeaten start to the season and maintained their position at the top of the Pro12 with a convincing six-try win over Edinburgh. A penalty try and touchdowns by Jared Payne and Pienaar helped Ulster lead 24-17 at half-time, with Roger Wilson, Payne and Craig Gilroy crossing the line for the home side after the break. Pienaar kicked six conversions to take his personal points tally to 17 points. Tom Brown scored two tries and Gregor Hunter kicked 10 points for Edinburgh. The one disapppointment for last year's Heineken Cup finalists was the sight of Stephen Ferris hobbling off with a knee injury early in the second half. Ulster were looking to extend their run of unbeaten games in all competitions to nine, while Edinburgh were hoping for better after a run of six consecutive defeats. The home side failed to assert their authority in the early stages and Brown completed a fine move from the back division by diving over the line in the 10th minute. Fly-half Hunter added the additional two points for Michael Bradley's outfit. Niall O'Connor replied with a penalty five minutes later after coming on as a replacement while Pienaar received treatment for an eye injury. Hunter kicked a penalty to restore Edinburgh's seven-point advantage, but Ulster were awarded a penalty try by referee Nigel Owens on 29 minutes after Edinburgh infringed at a scrum in front of their own line, Pienaar converting. Soon after, Gilroy broke down the wing and passed for Payne to score his fourth try of the season under the posts, with Ulster's Springbok fly-half landing the simple conversion. The South African scored his try in the 35th minute when he charged down an attempted kick by Hunter and ran on to touch down and then convert. Brown responded by crossing the line for a second time in the 37th minute and Hunter kicked between the posts to reduce the visitors' deficit to seven points at the interval. A Hunter penalty saw the Scottish side eat further into the Irish province's lead, but Wilson went over in the corner after good work by Pienaar and Payne, for his first try since returning to his home province, after 57 minutes. Pienaar added the extra points with his best kick of the match from a tight angle near the touchline. Payne, playing at centre intead of his customary position at full-back, grabbed his second try after meeting a beautifully weighted pass by O'Connor with a perfectly angled run, Pienaar maintaining his 100% record with the boot. To the delight of the home crowd, the impressive Gilroy shrugged off the challenge of Sean Cox and outpaced the visiting forward to secure his side's sixth try in the final minute and complete a fine performance by the young winger. Coach Mark Anscombe will not be happy with the number of turnovers conceded by his side but the Irish outfit were far superior to their opponents and deserving of their bonus-point victory. Ulster: R Andrew; C Cochrane, J Payne, P Wallace, C Gilroy; R Pienaar, P Marshall; C Black, N Brady (capt), J Afoa, L Stevenson, N McComb, S Ferris, M McComish, R Wilson. Replacements: N Annett, R Lutton, A Macklin, R Diack, N Williams, N O'Connor, S Olding, P Nelson. Edinburgh: G Tonks, L Jones, J Houston, J King, T Brown, G Hunter, C Leck, J Yapp, A Titterrell, W Nel, G Gilchrist, R McAlpine, S Cox (capt), R Grant, S McInally. Replacements: A Walker, A Jacobsen, L Niven, van der Westhuizen, Watson, Rees, Fife, S Visser.